At Evostyle we not only bring to life beautifully designed timber products, we also have a strong ethical and moral ethos that is behind every piece of solid timber furniture we manufacture. 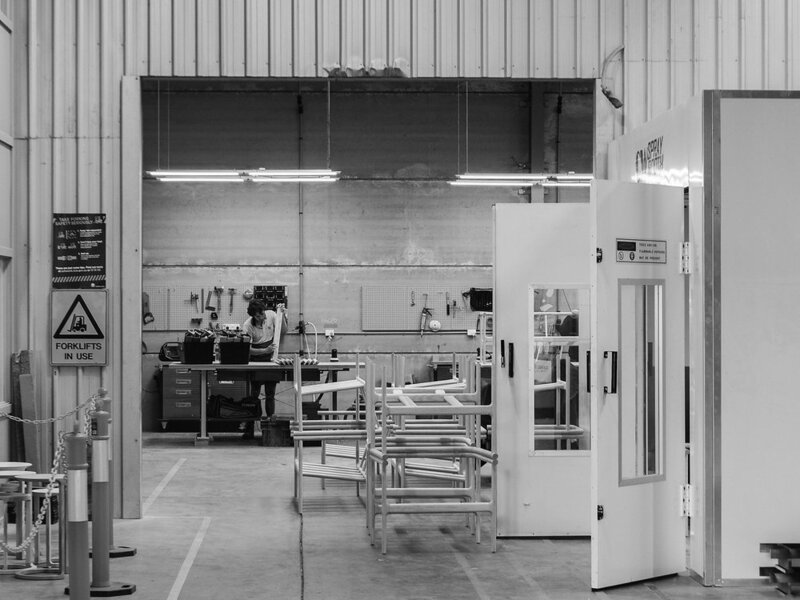 We have grown from our humble beginnings 30 years ago in a backyard garage, to a large purposely fitted out workshop on the outskirts of Sydney employing Cabinet Makers, CNC operators, Wood machinists, Polishers, Programmers and Apprentices. What started out as a father and son partnership has grown into a much bigger business where we have gained a solid reputation in the industry for locally manufactured products and machined components that bridge the gap between one-offs, yet not so large that manufacturing needs to be sourced overseas. We are small enough to give friendly personalised service to get initial prototyping off the ground, yet large enough to cope with large commercial projects. At Evostyle we have embraced technology as we have grown, and have two state-of-the-art 5-axis CNC routers, a 3-axis CNC router and a CNC lathe amongst lots of other more traditional machinery. This enables us to produce the most complicated solid timber components for the largest of projects. Evostyle is a great partner to architects and designers by being able to offer expert advice in machining solid timber and be able to produce complex machined products. Our high-tech machinery and talented team of craftsmen produces products that people love, that people care about, that people want to touch and feel and that people know has been lovingly made with care to the utmost stringent quality. We want to manufacture solid timber products that won’t have an adverse impact on the environment and that keeps sought-after skills in Australia. We are firm believers that Australian manufacturing should still be an option for designers in future. At Evostyle, we want to use sustainably sourced material in the products we produce and work with and we want to give back to the community. We do this by donating all our off-cuts to local Men’s Sheds, and sawdust to local chicken farms for animal bedding. In 1988, Luke Ommundson joined his father Victor in the family business. Luke originally didn’t have any plans for a career in woodwork, but when his father became desperately ill one year and was hospitalised for 6 months, he had to leave university and (as the eldest son) step up and take over a business he knew nothing about just to keep food on the table. Luke became a talented woodworker, and under the direction of Victor (who himself was a 2nd generation craftsman) and learning the trade of Woodturner, learnt many skills. Their business was called Express Woodturning, and they made thousands of components for Freedom Furniture, Fantastic Furniture and other large furniture manufactures. During this time Louise Ommundson was finishing a degree in Architecture at UNSW, and when the pair met in 1991, they were happy in their individual careers, and had no intention of working together. All this changed in early 2001, when Victor died suddenly on the golf course and Luke lost not only his father, but his business partner and best friend. Express Woodturning had grown and added a few employees, however the loss in direction was crippling for Luke who then turned to Louise for not only moral but business support. What made things worse was China’s increasing dominance in Australian manufacturing, which saw more and more components being made overseas and shipped in. Things were looking grim for a hardworking couple who had just started their family. Although Louise began to help the business with doing the bookkeeping and the pair could see that their combined skills and talents could work together and turn Express Woodturning into a new business focused on supporting Australian designers. They positioned themselves as high-end so as not to compete and be in the same space as cheap imports. Evostyle was officially started in 2010, and since then Luke and Louise have worked tirelessly to build their business to be one of the favoured Australian manufacturing businesses in the design industry. They embraced technology at every turn, and now have two state-of-the-art 5-axis CNC routers, as well as another 3-axis CNC router and a CNC lathe. This enables them to stay at the top of their game and produce the most complicated solid timber components on mass. Evostyle also has a strong ethical and moral ethos, and believes strongly in environmental and sustainable principles, which is why they work mainly with American hardwoods which are not only amongst the most beautiful in the world but are also very sustainably sourced from private properties around the USA. Evostyle has a strong connection with AHEC (American Hardwood Export Council), and the two companies work together to inform people around the world about the environmental issues around timber and forestry with the aim to reduce the amount of rainforest timbers being used on products in lieu of alternative sustainably sourced timber species that may be just as suitable for a project. Evostyle also cares about the local community and donates all their timber off-cuts to local Men’s Sheds, as well as giving their sawdust to local chicken farms for animal bedding. In this way land waste is reduced, and what material can’t be used by Evostyle is recycled in some way. In the last four years, their waste has been reduced by 75%. In 2017, Evostyle relocated to bigger and better premises, and this purposely fitted out workshop has enabled them to keep growing. They now employ Cabinet Makers, CNC operators, Wood machinists, Polishers, Programmers, Apprentices as well as a small office staff. They are proud of what contribution they are making to the Australian Manufacturing industry by keeping skills in Australia that may otherwise be lost forever. For this reason, they make a committed effort to regularly take on Apprentices and teach them skills. In the future Evostyle hopes to continue working with Architects, Builders, Furniture Designers and retailers that are committed to re-building the design and manufacturing industries in Australia and make the most beautiful furniture that will still be around in generations to come.